When you consider your legacy, you think of the people, lives and experiences that shaped you, as well as the lives that you have impacted. 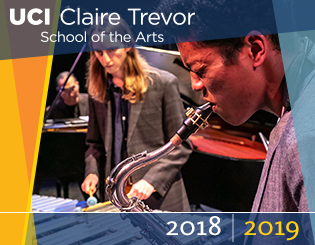 As you contemplate your legacy, please consider UCI Claire Trevor School of the Arts. When you leave us a portion of your estate, you create a lasting legacy. A Legacy that will help tomorrow's leaders benefit from UC Irvine. A legacy that will help shape the world for the better. Creating a legacy through your estate can easily be done through Charitable Gift Annuities, Charitable Lead Trusts, and Bequests. We are committed to working with you and your financial advisors to find the best giving mechanism for you. Do you already have the Claire Trevor School of the Arts in your estate plans? Please let us know. We would love to recognize you for this generous support in your lifetime as a member of our Legacy Society. To learn more abou how you can make a lasting impact contact Jana A. Cain, CFRE at (949) 824-8750 or jana.cain@uci.edu.